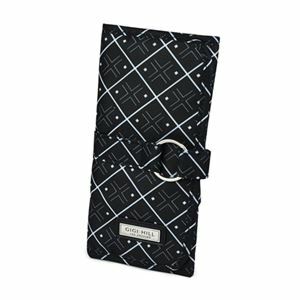 Protect your makeup brushes with this sleek and portable roll-up makeup carrier, featuring a chic black and white diamond pattern. The Mikayla Geo Brush Roll includes 8 brush slots, with a roomy zipped storage pocket and a fold-over wipeable ?ap to keep brush heads clean and protected. The Mikayla rolls up nicely to a convenient travel size with a belt-style velcro closure to keep it everything secure! Makeup & brushes not included.